Hi everyone. Still a little under the weather but the antibiotics are really starting to take hold. Still have a cough, and sound like I have been screaming at the top of my lungs all night. I can't wait for my voice to come back to normal. Today for you I have a treat.....a cupcake kind of treat! 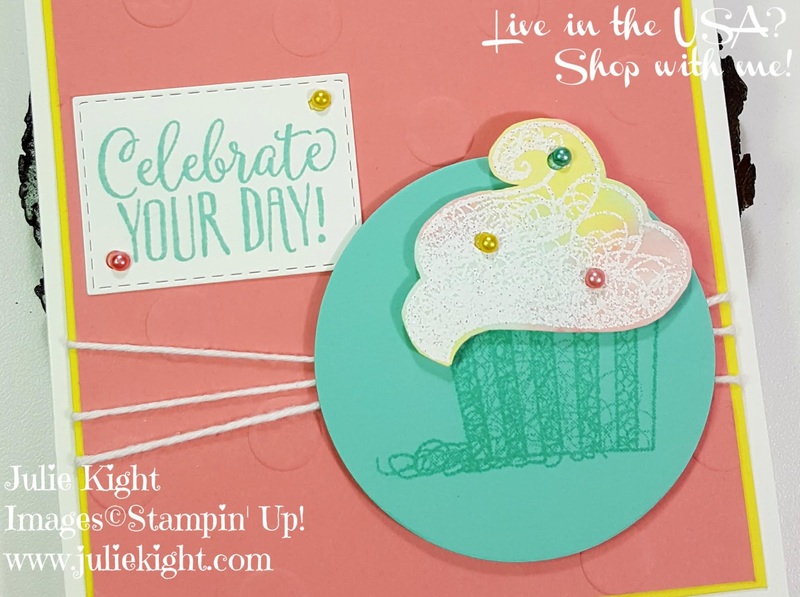 Now you can only get this free stamp set during Sale-A-Bration with any $50 order before tax and shipping. Click here to place an order. You could easily purchase everything I used to make this card and qualify to get the stamp set for free! I wanted to keep this card more simple then what I usually do to make it easy for you to copy if you wanted to. 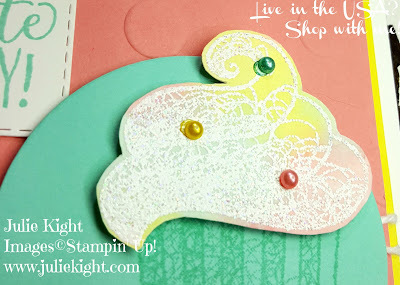 I first used some Watercolor paper to make the frosting then I heat embossed with the stamp in the set with a mix of White Embossing powder and Dazzling Diamonds Glitter, then I simply cut it out. I embossed the background paper and used the new Rectangular Stitched Framelits from the Occasions catalog for the title. I am so excited for these new Framelits! I wrapped some White Twine around the layers and added some of the Basic Pearls that I previously colored for another project. 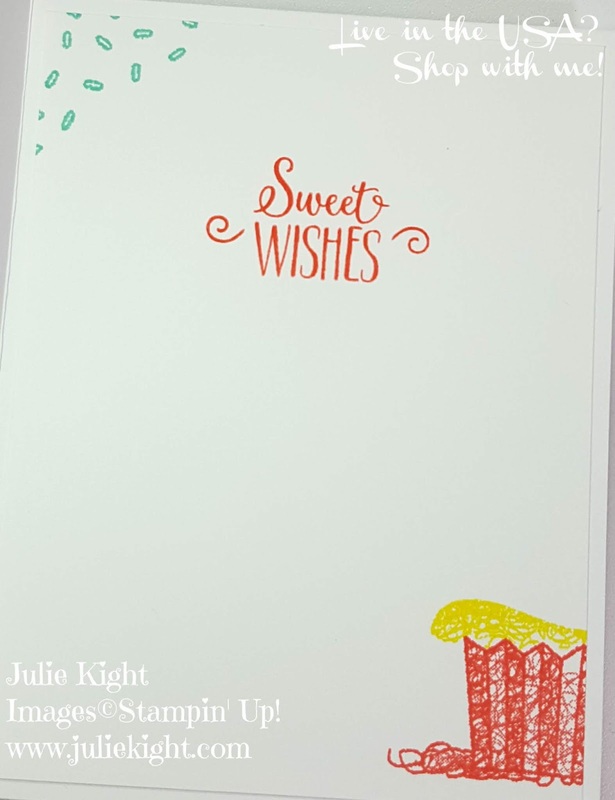 It's such a bright and cheery card. I stamped the inside as well. This time I used the little frosting on top of the cupcake. This stamp set is just too adorable to not get and can be used for way more then just birthdays. 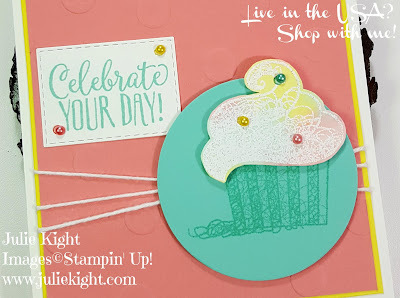 Have you seen the new Occasions and Sale-A-Bration catalogs yet??? If not click here to see them now! Thanks for visiting my blog today and I will see you again on Monday.